The traditional hydrographic surveying process used for hydrographic mapping during the last few centuries involves taking depth measurements from the surface of the water. Originally, such hydrographic surveys used water depth measurements made with a lead line. That device consists of a sounding lead attached to a graduated and marked line. The advent of echo sounders (fathometers) in the mid-1900s completely revolutionized hydrographic surveying and made surveying in deeper water practical. Echo sounders are devices that measure the time required for a sound wave to travel from its point of origin at the surface to the bottom and return, and then convert the measured time to depth based on the speed of sound in water. Since depths are measured from a transducer, typically mounted on the bottom of the vessel’s hull, a draft correction has to be applied to the soundings for correction to the actual depth of water. In addition, since the water level in most waterbodies changes constantly with time due to tides and/or meteorological conditions, the soundings also must be corrected to a common datum as opposed to the level of the water at the time of the measurement. Such corrections often add uncertainty to the measurements. Recent innovations have resulted in multi-beam fathometers, that measure an array of points simultaneously as well as processes for the use of GPS for vertical control to reduce errors due to uncertain draft and datum corrections. Nevertheless, even with such advances in sounding technology, most hydrographic charts today are based on widely-spaced sounding lines. This is especially true in the near-shore areas since the relatively shallow depths restrict the use of multi-beam fathometers. Therefore, such charts generally do not purport to provide a high-resolution coverage of the submerged lands. Further, the coverage of existing hydrographic charts usually do not include many non-commercially navigable coastal areas or smaller streams and rivers. Yet, due to large-scale rises in sea level since the last glacial maximum, those very areas often contain much evidence of early animal and plant life as well as of past civilizations. Good examples may be seen with two drowned river channels (Aucilla and Econfina Rivers) now located in the shallow margins of the Big Bend area of the Gulf of Mexico. Although not depicted in detail on published charts, those underwater channels contain numerous sinkholes, freshwater springs, and other small features. Further, these areas are rich in archeological resources dating from the very early Paleoindian tradition to the early part of the Middle Archaic when water levels were much lower. At that time, the karst channels and sinkholes were the primary source for water for early humans as well as for other forms of animal life. In addition, this offshore area was extensively quarried by early Native American populations for its Coastal Plain chert resources. Thus, higherresolution mapping of near-shore areas is needed. Such mapping is critical for learning more about the nature of sea level change itself, as well as the effect of sea-level change on the geology and hydrogeology of the earth, and on the adaptation of animal life (including humans) and vegetation to such change. Figure 1 Two bathymetric LiDAR systems have recently become commercially available. Following are discussions of the two systems and illustrations from tests of those systems. One promising approach for higher resolution mapping of shallow underwater areas is laser scanning with airborne bathymetric LiDAR (Light Detection And Ranging). With its capability for high-resolution mapping of topography in tree-covered areas, airborne LiDAR is often used for topo mapping. In addition, tripod- mounted laser scanners are in wide used for delineation of upland topography. Yet, the LiDAR systems more commonly used for those applications use lasers with a wave length in the infrared spectrum which reflects off water surfaces. Thus, those systems are not useful for hydrographic measurements. Fortunately, recent developments in the use of green lasers in airborne scanning have allowed the application of this technology for creating precise digital models of underwater features. 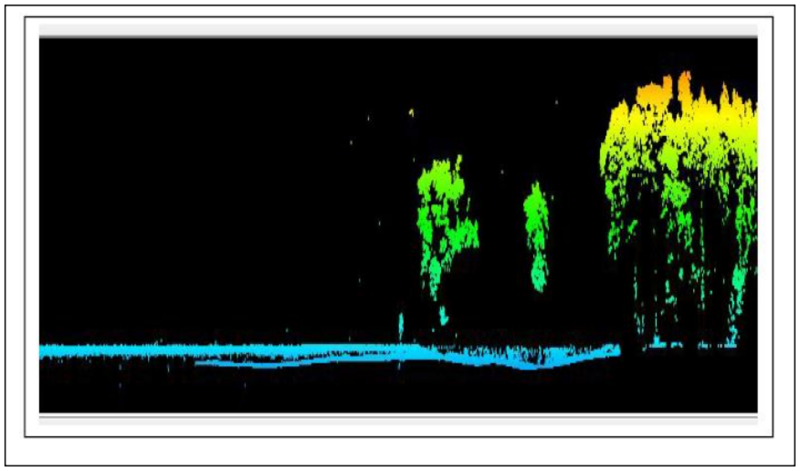 LiDAR systems designed for bathymetry use two systems, one in the infrared spectrum with a typical wavelength of 1064 nm and another in the green spectrum with a typical wavelength of 532 nm. The infrared wavelength signal is reflected by the water surface and thus may be used to determine the distance to the water surface. The green wavelength continues through the water and is reflected from the submerged land surface. Thus it may be used to determine the distance to the bottom. (Figure 1). One such bathymetric LiDAR system was developed by the Riegl Corporation. That system is advertised as having a penetration capability of about one Secchi depth down to a depth of 10 meters. 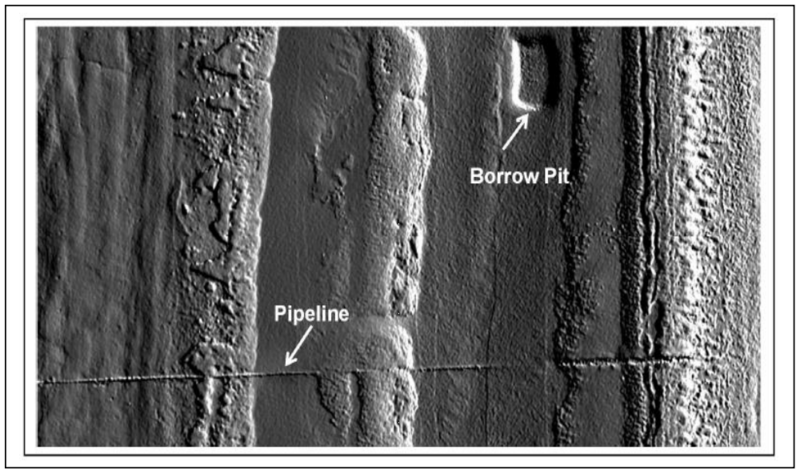 That system has been used for the mapping of an ancient submerged Roman harbor site in Kolone, Crotia and of another archeological site in Lake Keutschach, Austria (Doneus et al 2014) . In the Croatian study, penetration depth of up to 11 meters was reported while penetration in Lake Keutschach, which had more turbid waters, was only 1.6 meters. The Riegl system was recently tested by the Suwannee River Water Management District in the Manatee Springs area near Chiefland, Florida (Cole 2014). The coverage of the test included the spring basin itself, the spring run leading from the basin to the Suwannee River, and the river for about 1000 feet above and below the confluence. The area was chosen to provide a wide range of depths and with turbidity conditions ranging from the clear spring water at the spring head to the more turbid Suwannee River as well as representing an area with adverse tree cover conditions. The LiDAR data acquisition was flown at an altitude of 550 meters above ground level. Cross Section of Manatee Springs Run and the Suwannee River Note that bottom trace was lost in river for depths greater than 8 feet. For evaluation of the results, turbidity sampling was performed in the Suwannee River portion of the test area. In the river, turbidity measurements with a Secchi disk in the river resulted in visibility ranging from 12.8 to 14.9 feet. Water clarity was considerably better in the spring basin and run, although, due to restricted access because of the concentration of manatees in the springs during the flight, turbidity readings in the springs were not taken. 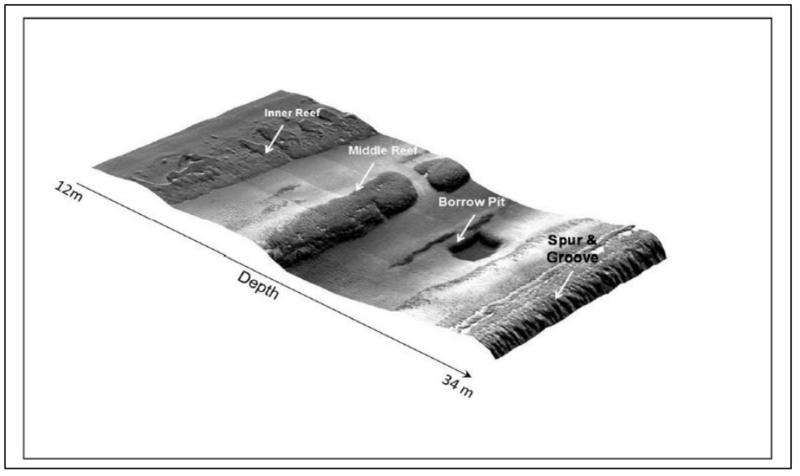 The LiDAR data produced a high-resolution model of the basin and run for Manatee Springs itself with depths down to about 30 feet (Figure 2). Interestingly, even the manatees present in the springs at the time of the flight were “mapped”. A preliminary analysis of the accuracy of the bathymetric elevations obtained by this technology was performed by comparing the LiDAR measurements with depth soundings at 31 locations in the spring basin and run. That analysis indicated a mean error of 0.10 feet and an error range of -0.63 to 0.35 feet (Karlin 2014). Unfortunately, this was not the case in the Suwannee River itself with its higher turbidity. The bottom trace projected only a limited distance in the Suwannee River (Figure 3). As may be seen, in areas with depths greater than about eight feet there was no bottom reflection even though the Secchi depths in the river ranged from 12.8 to 14.9 feet at the time of mapping. Riegl personnel have suggested that a possible reason for the lack of deeper penetration is the black mud bottom surface in this area which possibly absorbed the laser signal, rather than reflecting it. Another bathymetric LiDAR that has recently become commercially available is the CZMIL system developed by Teledyne Optech. That system has a claimed penetration of 2.5 Secchi depths down to 80 meters, which is considerable more than the Riegl system which has a claimed penetration capability of one Secchi depth down to about 10 meters. This system has reportedly been used on coastal projects along both the East, West and Gulf Coast of the United States as well as in numerous other coastal projects worldwide. That system is advertised as being ideal for turbid waters and muddy, less reflective seafloors (such as was the case in the Suwannee River at the Manatee Springs project) due to the processing program. Figures 4 and 5 illustrate products of that system at depths as great as 34 meters in an area offshore of Ft. Lauderdale, Florida. 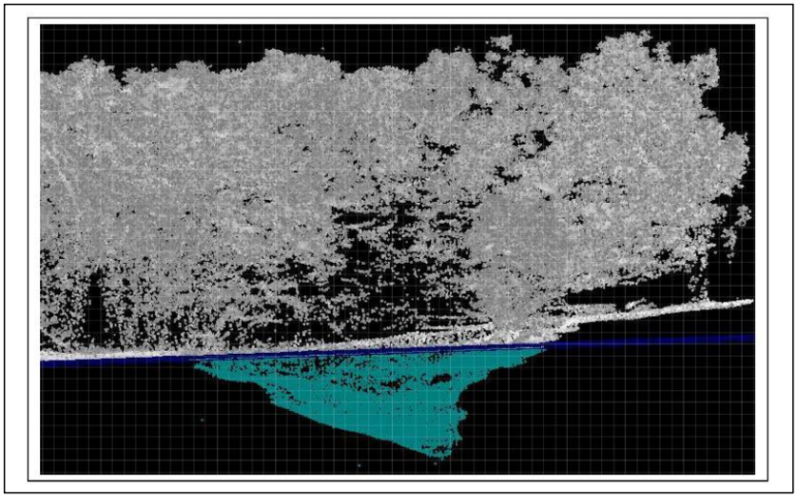 As may be seen from the illustrations presented, airborne bathymetric LiDAR appears to offer an ideal solution for high resolution mapping of underwater features in near-shore waters where conditions allow its use. Further, it allows coverage of areas in shorter amounts if time, allows coverage of areas inaccessible by boat due to shoals and reefs or shallow water, and provides a full 3-D model from the land to the maximum water depth. Therefore, it has great promise for environmental and archeological research. A consortium of federal agencies called JALBTCX is in the process of mapping some of the coastal areas of the United States using bathymetric LiDAR. Yet, such mapping will undoubtedly be concentrated in areas of importance to navigation. As previously mentioned, many of the near shore shallow reaches of the areas such as the Northern Gulf of Mexico contain a treasure of information for hydrological, biological, geological and archeological studies, and research is limited by lack of high resolution bathymetric surveys. Therefore, additional mapping projects using this technology in those areas is encouraged and grant applications for such mapping are pending. Cole, George M. “Airborne LiDAR Hydrography for Managing Florida’s Water”, Hydrography – More than Nautical Charting, www.nauticalcharts.NOAA.gov. 2014. George M. Cole is a professional engineer, surveyor and geographer and a member of the Board of Directors of Aucilla Research Institute. Cole holds a bachelor of science degree in mathematics from Tulane University as well as master of science and doctor of philosophy degrees in geography from Florida State University. His background includes several years of service (final rank: Lt. Commander) with the U.S. Coast & Geodetic Survey (now part of NOAA); as the State Cadastral Surveyor for Florida; as President of an engineering and surveying firm with projects including LiDAR surveys in Central America; and as a Professor at the University of Puerto Rico. Cole currently serves as a private consultant and continues to serve as an Adjunct Professor at both the Florida State University and at the University of Puerto Rico. Cole has served as technical adviser to several states on boundary issues; and has provided expert testimony to a number of local, state and federal courts. He also has made significant contributions to professional literature and is the author of several surveying textbooks (with notable examples being Water Boundaries, John Wiley & Sons, 1997, Surveyor Reference Manual, Professional Publications, 2009, and Land Tenure, Boundary Surveying and Cadastral Systems, Taylor & Francis, 2016.